The North Oregon Coast is a challenging place to build. The high winds and large amount of rainfall make exterior finishes critical to the longevity of the house. I have developed a list of features to avoid and features to include in the beach homes I build. No flat roofs, no low slope roofs under a 4 in 12 pitch. Recommended minimum pitch roof 5 in 12. No flat roof decks over living space. If you must build a waterproof deck, build it over the ground, not over the building envelope. If you must have an upper level deck over living space, make it an enclosed sunroom, not a deck. No inset entry over a basement. Instead jog the foundation wall under the entry. No windows over 24 square feet in size. If you need a larger window, then install two windows with a structural mullion between them. No mulled windows. Install a structural mullion between them. No standard entry doors facing the west or south. If you must install a swinging door facing west or south, either use an Anderson Frenchwood Hinged Door, or install a fiberglass door with a really good storm door or roll-up shutter. On a fiberglass door, use a Plastpro jamb; regular jambs will rot out. An inset front porch will also work. Always install stainless steel door pans under swinging doors and under Anderson sliding patio doors. Most vinyl patio doors do not need a pan since they have a bottom fin. Stucco siding does not work on the coast. In my experience, cedar shingles or Hardiplank are the best way to go. My preference is to let shingles weather grey so they never need any paint, stain, or power washing. They can be painted or stained, but then it is required at least every 5 years. Install stainless steel hinges on exterior doors, solid brass usually works also. Watch for updraft. Rain can blow uphill so soffit vents must be installed correctly. Siding installation and caulking must be done correctly. No zero clearance fireplace chimneys. They are not made in stainless steel, only galvanized, so the only solution is to install a stainless steel sleeve over the galvanized chimney. Stainless Steel hinges, joist hangars, deck fasteners, screws, and flashing are necessary. Finished soffit is necessary. Roofing nails stick through unfinished soffits and they usually rust. I recommend stainless steel roofing nails, but roof sheathing nails are not stainless and oftentimes they will be close enough to the edge of the rafter to bleed through. 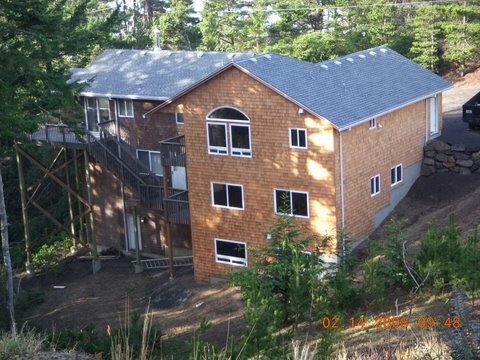 In my experience, Milgard windows are the best available windows on the coast. Milgard or Anderson PS patio sliders work best facing the weather. Roof vents are necessary, and lots of them. Always install positive mechanical connections on fans to roof or wall vents. This includes bath fans, kitchen fans, etc.